I first encountered a substantial selection of Owen’s work in the 1970s, in issue number five of a magazine called BIG DEAL, and have often wondered why she is not as prominent as some other poets associated with one phase or another of the “New York School.” She certainly did an extraordinary amount of heroic work in the community of poets in the Lower East Side. Steve Clay’s extraordinary documentary survey of independent presses is the best and most easily accessible source for beginning to appreciate the accomplishments of Maureen Owen as an editor and publisher. However, her own collections of poetry are even more deserving of our attention. Her most recent book, EDGES OF WATER, is from Chax Press in Arizona, a project that its founder Charles Alexander has made one of the outstanding literary publishers in the United States. Other books include AMERICAN RUSH: Selected Poems(Talisman House, 1998), which was a finalist for the L.A. Times Book Prize; and Erosion’s Pull (Coffee House, 2006). Barbara Henning’s books include four novels as well as collections of poetry, the most recent one being A DAY LIKE THIS (Negative Capability, 2015). “There’s something about painting I just can’t wait to get to, and something about writing I just can’t wait to get away from. Sunday’s winds brought mid-day rain, but yesterday around 12:30 p.m., the sunlight was bright, and the temperature got up to 58 degrees in Long Beach, California. 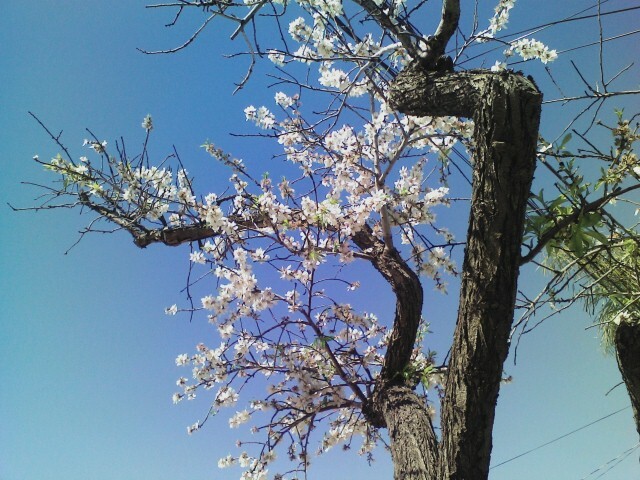 I walked out to the front yard, and took three photographs of the almond tree that somehow managed to survive five years of drought, despite our extended absence sometimes during very punishing heat waves. 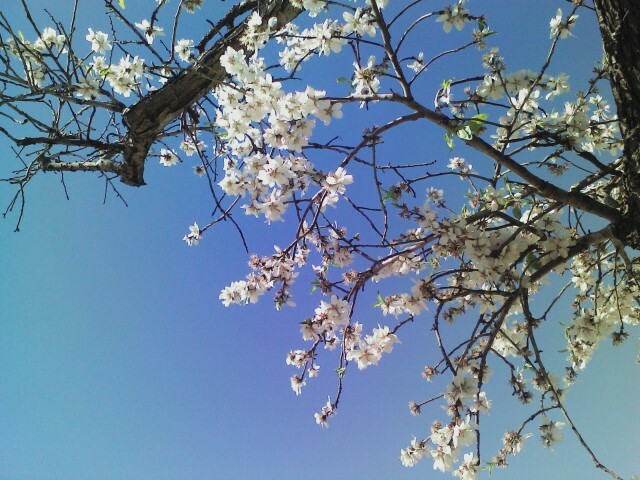 The appearance of these blossoms belies the mythic aura that echoes from popular songs about L.A.: “I’d be safe and warm / If I were in L.A.” (“California Dreamin'”). The reality, according to a recent L.A. Times article is that more homeless people suffer from hypothermia in Los Angeles than in New York or other cold-weather cities. In fact, they don’t merely freeze their butts off. They die. Last night, the temperature in Long Beach dropped to 41 degrees, which is not freezing as such, but the problem is that hypothermia tends to set in when the temperature shift in the course of a day involves a drop of more than 10 degrees. There are 39,000 homeless people in L.A. County. That is roughly one out of every 250 people. THIS is a national emergency. We don’t need a border wall when there are so many people who need four walls and a roof and floor to shelter them from bone-chilling winter weather. 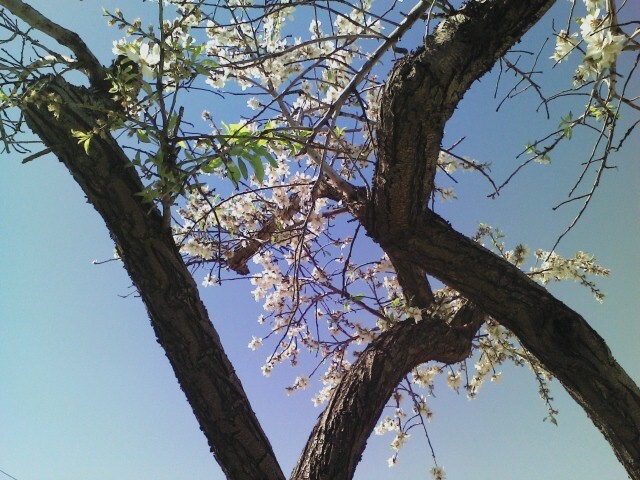 An Indian Plum tree, which squirrels used to scamper across our roof to get to when it was full of ripe fruit, did not survive, and we had to cut down its insect-infested trunk last year. 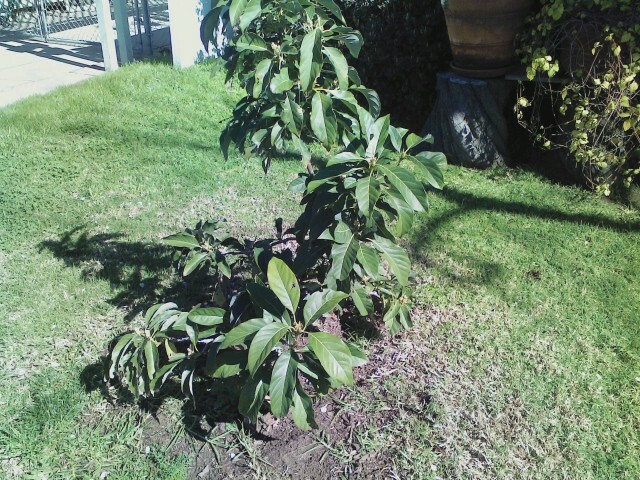 Linda had managed to coax an avocado pit into getting big enough that we planted it at the same place where the Indian Plum had been, and it is now as high as my solar plexus. Running a reading series is a largely thankless task: “Gratitude has no memory.” In general, poets want a place to read, but few are willing to do the work of curating and serving as on-site moderators. Given the amount of work involved, it’s no surprise that most reading series outside of those funded on college campuses don’t last longer than two or three years. The ones that do tend to be based at bookstores, but while those retail outlets are showing more resilience than might be anticipated as individually owned economic entities, the Great Recession certainly impacted the possible continuity of reading series that began in the last century and are still going today. One reading series that crossed that divide was run by Jim DOANE and the late Larry Colker at the Coffee Cartel in Redondo Beach (the same beach town rhapsodized about by Patti Smith). Twenty years of weekly readings (with only a few off nights) came close enough to breaking the four-digit mark of total presentations to justify the title of a retrospective anthology: 1001 Nights; Twenty Years of Redondo Poets at Coffee Cartel 1998-2017. Not every poet who gave memorable readings at the Coffee Cartel appears in the volume. Richard Garcia, for instance, who is one of the very best poets now working in the United States and whose work preeminently deserves translation into at least a score of languages, doesn’t have a poem in this volume. As a culminating gesture, however, the poetic heroes of the Coffee Cartel sifted through nominations of poems read at the series by a couple dozen poets who are primarily working in Southern California, and this book serves as yet another piece of evidence to confirm the ongoing vitality of a regional renaissance in American poetry that began in 1948, with Grover Jacoby’s first editorial project, Recurrence. Ellen Bass, Michelle Bitting, Laurel Ann Bogen, Lynne Bronstein, Elena Karina Byrne, Helene Cardona, Brendan Constantine, Amelie Frank, Jessica Goodhart, Donna Hilbert, Elizabeth Iannaci, Charlotte Innes, Suzanne Lummis, Rick Rupert, Sarah Maclay, Ellen Maybe, Michelle Mitchell-Foust, Bill Mohr, Jim Natal, Kim Noriega, Judith Pacht, Candace Pearson, Cece Peri, Marilyn N. Robertson, Beth Ruscio, Cathie Sandstrom, Gerard Tarnat, Joan Jobs Smith, David St. John, Kevin Patrick Sullivan, Paul Suntup, G. Murray Thomas, Lynne Thompson, Carine Topal, Fred Voss, Pam Ward, Charles Harper Webb, Hilda Weiss, Cecilia Woloch, Nancy Lynee Woo, Tim Xonnelly, Brenda Yates, and Mariano Zaro. Many of these poets will be familiar to readers who have copies of anthologies such as GRAND PASSION and WIDE AWAKE, as well as STAND UP POETRY. Only four of them, however, appeared in my 1985 anthology, POETRY LOVES POETRY. As editor, I am the only poet to appear in 1001 Nights to appear in THE STREETS INSIDE: TEN LOS ANGELES POETS (1978). I am happy to report, though, that many of the other poets in that volume (which is so scarce that not even rare book dealers seem to have a copy of it) are still alive and working: Eloise Klein Healy, Holly Prado, Harry Northup, Deena Metzger, Kate Ellen Braverman, Peter Levitt, and Jim Krusoe, though Jim works only as a novelist and short-story writer now. NOTE: Jim DOANE’s last name is capitalized because every time I type it, the word comes out “Diane.” No matter how often I correct it, it changes his last name to “Diane.” No doubt there is some way to override this spelling mechanism, but I wonder what it is about a system that cannot recognize and defer to the person doing the work.